Home / Prohormones / MuscleGen Research Andro-1-Dione 90ct, BOGO 50% Available!! MuscleGen Research Andro-1-Dione 90ct, BOGO 50% Available!! 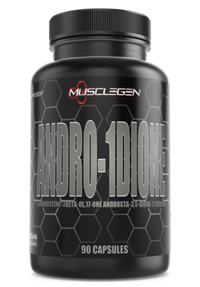 Special Promo – buy 1, get 1 at 50% off on MuscleGen Research Andro-1-Dione, with free shipping! Discount will show up in shopping cart when you select 2 or more items. This is for a limited time only!! Your boarding pass for building lean mass has arrived! It’s simple, the more anabolic you are, the more muscle you can gain. Then go 7x more anabolic with Musclegen Researches newest innovation – ANDRO-1DIONE. What is in this that makes this product so amazing? 1-androstene-3beta-ol,17-one and adding in Androsta-3,5-diene-7,17-dione. We have an independent third party lab test to insure no less than 98% purity. That means, you get the very best! The active compound in ANDRO-1DIONE goes through a double conversion process to become 1-AD, an anabolic compound that is 7 times more anabolic than testosterone to promote increases in lean muscle mass, muscle hardness and strength! A dry bulking compound that doesn’t retain water so you pack on mass without the worry of losing your muscle definition! So what’s the different about ANDRO-1DIONE? Essentially this compound is a time released version of the highly popular 1-Andro. By time releasing the compound it increases its bioavailability by roughly 30%. The powerful lean muscle builder just got an upgrade to first class! Grab your boarding pass and get on your lean bulking journey with ANDRO-1DIONE Now! A compound that is also known as 1-DHEA, this compound is a DHEA derivative and compound converts into 1-testosterone, also known as 1-AD – a compound that is 7 times more anabolic than testosterone. Super 1-”Andro has an enanthated ester attached to the molecule which makes it time released, allowing it to remain active in your system longer which allows your body to make better use of the compound. This compound is reported to be 30% more bioavailable than normal 1-Andro. There is no conversion to estrogen with this compound so water retention is a non-factor. Additionally, as the muscle increases are dry in nature, gains are fairly easy to sustain during and after post cycle therapy.